The changing lifestyle and growing preference for packaged food has grown the demand for vacuum packaging. Vacuum packaging helps in providing better shelf life, better flexibility, and portability for the food. Nowadays, more than 20% of the manufacturers have started using vacuum packaging. In addition, the players in the market introduce innovative solutions to meet the functional requirements of various end-user, especially in the food and beverages segment. The rising disposable income and growing preference to spend on hygiene food has also grown the demand for vacuum packaging that will provide a fillip to the market. The global vacuum packaging market is prophesied to rise at 4.9% of CAGR during the forecast period between 2016 and 2024. The valuation for the market is expected to reach US$22.8 bn by the end of 2024, progressing from US$15.0 bn as estimated in 2015. The global vacuum packaging market is categorized on the basis of pack type, material, and application. Based on material, the market is divided into polyvinylidene chloride (PVDC), polyethylene (PE), polypropylene (PP), polyester (PET), polyvinylchloride (PVC), and polyamide (PA). Out of these materials, polyethylene (PE) is likely to dominate the market and held 38% of the complete market in 2016. This segment is expected to rise at 4.6% CAGR over the forecast period and remain the dominant contributor to the revenue of the global market. Moreover, extended shelf life and higher barrier films of polypropylene packaging are the other factors that helps in fueling the market growth. The application of vacuum packaging is seen in food and beverages, industrial goods, pharmaceuticals, and consumer goods. Of these, the demand for vacuum packaging is high in food and beverages. This segment is likely to dominate the market during the forecast period. Based on pack type, the global vacuum packaging market is divided into rigid packaging, semi-rigid packaging, and flexible packaging. Out of these, the flexible packaging segment is projected to lead during the forecast period as is it used for packaged food. On the regional front, Europe is projected to lead the global vacuum packaging market and is considered as the most lucrative regional market in terms of revenue generation. In 2016, the market held 32.4% of total market share and expected to do so in the forthcoming years. After Europe, North America and Asia Pacific are favorable markets considered for the growth of the vacuum packaging. The vacuum packaging market in North America is expected to rise at 5.3% CAGR over the forecast period and is likely to create significant demand for vacuum packaging. Moreover, United Sates is the leading country in the region where large number of manufacturers are present and the demand for vacuum packaging is also very high in this country. Furthermore, the Middle East and Africa are also considered as prominent markets for the vacuum packaging, but is projected to undergo huge losses in terms of incremental opportunities. In contrast, Latin America that accounts for a very small share in the global market is projected to rise at 4.9% of CAGR over the forecast tenure. The report has elucidated on some of the key players and their contribution to the global vacuum packaging market. To mention some of the leading players in the market are Wipak Group, Amcor Limited, Bemis Company, Sealed Air Corporation, Berry Plastics Inc., and Mondi Group. This Transparency Market Research report examines the global vacuum packaging market for the forecast period 2016-2024. 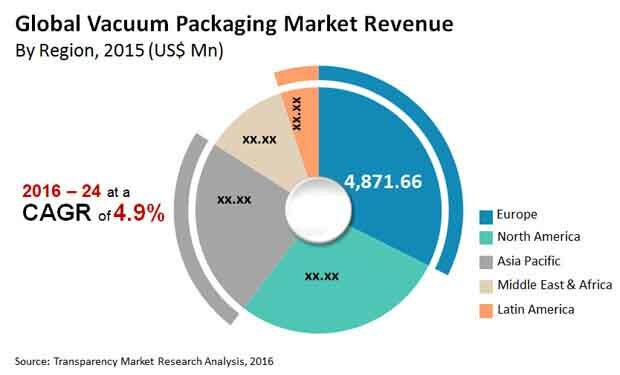 The primary objective of the report is to identify opportunities in the market and present updates as well as insights pertaining to various segments of the global vacuum packaging market. Nowadays vacuum packaging is one of the most acceptable approach for packaging food and other products. The process for vacuum packaging involves withdrawal of the air included in the package and then sealing it. Vacuum packaging is a common technique of extending the shelf life of food related products without adversely impacting their quality. Vacuum packaging is segmented on the basis of material type, packaging type, application and region. New and innovative developments which includes production of vacuum packages that holds recyclable packaging, and light-weight packaging are accumulating value to the vacuum packaging market. Robust consumption of convenience and processed food has been the major growth drivers of the global vacuum packaging market. Rising awareness about food safety and hygiene have become consumer’s foremost urgency. This has accelerated the demand for vacuum packaging globally. Escalating household income as well as consumer inclination to spend for hygienic food are anticipated to impel the growth of global vacuum packaging market during the forecast period. Apart from this, speedy industrialization in the emerging clusters of the globe, coupled with higher population growth is anticipated to bolster the growth of global vacuum packaging market during the period 2016-2026. The report begins with an overview of the global vacuum packaging market, evaluating market performance in terms of revenue, followed by TMR’s analysis of key trends, drivers, and restraints witnessed in the global market. Impact analysis of the key growth drivers and restraints based on the weighted average model is also included in the report. The report further analyses the market based on material type and presents the forecast in terms of value for the next eight years. The next section of the report analyses the global vacuum packaging market on the basis of distribution network and presents the forecast for the next eight years. The report further analyses the market based on primary usage and presents the forecast in terms of value for the next eight years. Following this section includes analysis of the global vacuum packaging market on the basis of region and forecast in terms of value for the next eight years. To compute the market size, in-depth secondary research is done. Data points such as regional splits and market split by material type, distribution network and primary usage as well as qualitative inputs from primary respondents have been assimilated to arrive at appropriate market estimates. The report comprises the forecast of the global revenue generated by the sales of vacuum Packaging Market. TMR triangulates the data via different analysis based on supply side, demand side as well as the dynamics of Vacuum Packaging Market. Another vital feature of this report is the analysis of the Vacuum Packaging Market by region, material type, distribution network and primary usage and the corresponding revenue forecast in terms of absolute dollar opportunity. This is traditionally overlooked while forecasting the market. However, absolute dollar opportunity is critical in assessing the level of opportunity that a provider can look to achieve as well as to identify potential resources from a sales perspective of the global vacuum packaging market. To understand key segments in terms of their growth and performance in the vacuum packaging market, Transparency Market Research has developed a market attractiveness index. The resulting index should help providers identify existing market opportunities in the global vacuum packaging market. In the final section of the report, vacuum packaging market competitive landscape is included to provide a dashboard view of companies that manufacture and provide services of vacuum packaging market. The report contains company profiles of some of the key players in the global vacuum packaging market.